Ambassador Jari Luoto works as the implementation and assessment group coordinator of the Global Initiative to Combat Nuclear Terrorism. 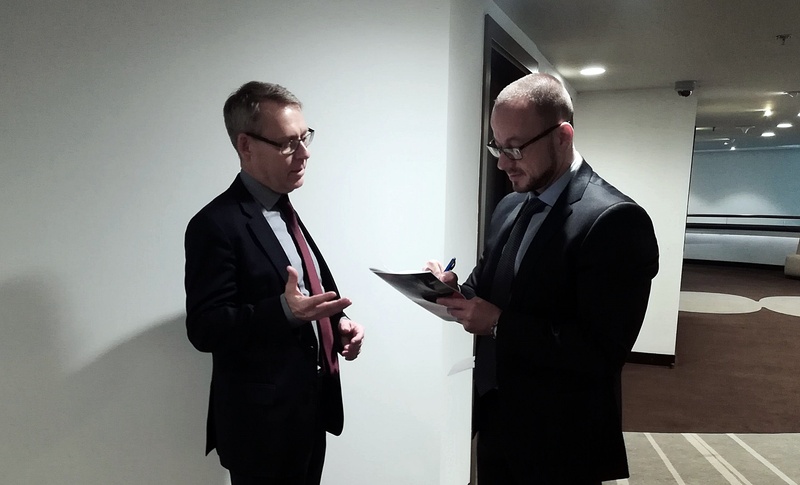 During the GICNT workshop in Budapest Mr Luoto gave a short interview about some aspects of this interesting topic, mainly in connection with the focus of this workshop. First of all I would like to thank you for finding the opportunity and time to be interviewed. As I started to think about this topic, some questions came to my mind immediately, most of them with concerns. Is it simply that we are lucky for not having faced any serious terror attack with radioactive material involved until now, or is it due to hard and systematic protective work? Some specialists say that we are indeed lucky. Of course we should prepare, and that is exactly what the GICNT is doing with its activities: enhancing partner nations’ capabilities to prevent, to detect and respond to nuclear security threats. How many times and what type of radioactive material is stolen a year? What is the quantity involved? We know that there are thousands and thousands of cases each year when radioactive material gets out of regulatory control. In most cases we are speaking about material which is not categorized as the most dangerous to human health, but we know that there are cases involving much more dangerous material. There are thousands of radioactive sources because these are widely used in hospitals, industry and agriculture. Unfortunately not all of these sources are well protected. There is a risk of it getting into the wrong hands. Do states regularly report on the loss or theft of radioactive sources? There is not an internationally legally binding obligation for states to report on the loss of radioactive sources. Therefore the databases on incidents are incomplete. The great majority – nearly 90% - of the cases that are reported to the IAEA come from only a handful of countries. It is likely that many cases are not reported and a lot of information remains confidential. If harm is done, what kind of international help can the impacted country expect? GICNT is working with its 88 partner nations and 5 international observer organisations to enhance partners’ capability to respond to threats to nuclear security. At the same time we are working towards better regional and global cooperation. We are not only sharing best practices and learning from each other but also building links between partners that will be helpful in combating these threats. Countries are already helping each other in very practical ways (e.g. sending expert teams and equipment). How can a workshop like this one in Budapest support the fight against nuclear terrorism? From this point of view, what would you highlight in the Hungarian program? The workshop in Budapest is an important addition to this series of GICNT events. We have been dealing with one of the most likely threats which is the loss or theft of radioactive sources. We have heard and seen many examples of how individual countries and institutions are working towards better security of these sources. We have also been looking at ways of effectively responding to a situation where a radioactive source has been stolen. The workshop has been well attended, with more than 90 participants from 25 countries. There are growing fears about terrorism worldwide. How did these fears and the increased attention influence GICNT activities in the last few years? I think it has made all of us think that work being done in this network has a high value. Political decision-makers should be aware of the threats to nuclear security and on how to respond effectively. GICNT’s work has been focused even more towards exercises and workshops that have a very “hands-on-approach”. It was extremely valuable that we had the chance to participate in the demonstration activity at the MTA EK in connection of this GICNT event in Budapest. The interview was made by Gábor Körmendi, communication officer of the HAEA.